Today, we have awesome giveaway. GDJ and 123RF.com to bring you yet another great giveaway. 3 lucky winners will be receiving a 1 month subscription account that enables them to download 5 High quality photos or illustrations per day from the 123RF.com website. These worth of each account is $89. If you are looking to win a high quality stock photo subscription valid for 30 days, then win a 30 days subscription account. 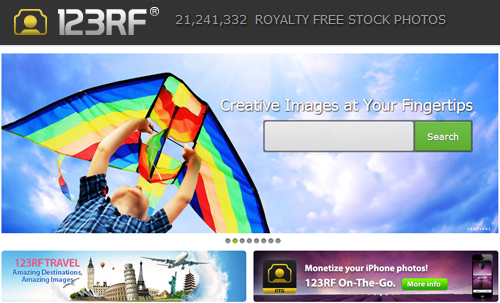 123RF.com is one of the world’s largest players in the royalty-free microstock photography industry. Since its debut in June 2005, 123RF.com today hosts over 21 million stock photographs and vector illustrations with over 100,000 contributing photographers and illustrators. 123RF.com has an amazing collection of stock photos you can use to create amazing Photoshop photo manipulations. Their website has a simple interface and loads quickly so you can find your images faster. 123RF.com also offers its clients the flexibility of acquiring images via subscription plans or credit packages, whichever suits their needs better. All you have to do to enter the giveaway is complete the steps below. This competition will run for the next 6 days. The 3 lucky winners will be selected at random and will be informed directly after the competition ends via Email. Good luck to everyone! I wuold like to these images for my home & office use…love to win this. use this images on my blog. I’m professional designer, and i need high quality illustrated photos for my commercial work.. I will use these images for my developing process. Currently working on a project for a client and can use some professional looking images. Will use of the images for a web design project I’m working on. You’ve just won the 123RF.com Giveaway hosted on graphicdesignjunction.com and have scored yourself a special 123RF.com Subscription Pack for 30 days!